With the world witnessing a paradigm shift toward the adoption of biodegradable and green fertilizers, ferric phosphate market has emerged to be a hot investment spot for agro-business holders in the recent years. The agricultural industry stands as one of the foremost sectors that contributes to the global economic growth & financial dynamics. However, with the ever-growing worldwide population and tighter food grain supply imbalance, the demand for fertilizers have seen a significant upsurge lately. This change of outlook has considerably stimulated the commercialization potential of ferric phosphate market demand from the agricultural domain, given the compound’s growing consumption as a raw material in fertilizers for improved crop yield. In consequence, this has had a considerably appreciative impact on iron phosphate industry that is certain to gain tremendous monetary benefits from the fertilizer segment alone. In fact, estimates by Global Market Insights, Inc., claim ferric phosphate industry size from fertilizers to register a 5% CAGR over 2018-2024. Another highly important factor driving ferric phosphate market share is the applicability of this business sphere across the food and beverage sector. Ferric phosphate (FePO4) has already established its position as a vital ingredient in balancing the nutritional deficiency, which if not met can lead to serious health problems like anemia. In fact, if reports are to be relied on, iron deficiency is the most prevalent nutritional deficit across the United States, and women are reportedly at a higher risk of anemia. Besides U.S., it is imperative to mention that nearly 202 million women were affected with anemia in South East Asia and around 100 million in Western Pacific in 2017. Given the significant numbers, it comes as no surprise that Asia Pacific remains as a significant hot spot for anemia prevalence. The increasing number of ferric deficient patient populace across this belt has further augmented the product penetration across APAC, which contributed for more than 50% of the overall ferric phosphate industry share in 2017. Having recognized the unique blend of characteristics of iron phosphate, many healthcare giants have been putting their efforts to unleash the potential of this compound in treating disorders such as chronic kidney disease (CKD). For the record, the increasing cardiovascular mortality rate has found to be closely linked with hyperphosphatemia, i.e. a low level of phosphate content in the blood. This disorder is quite common in patients suffering from CKD for and ferric based oral phosphate binders are often recommended by the healthcare experts to avert intestinal absorption of dietary phosphates. Several such oral binders have already undergone clinical testing and have received a green signal from regulatory bodies. Recently, for instance, the U.S. FDA has approved the phosphate binder ferric citrate for people suffering from ferric deficiency that has proved beneficial in reducing the FGF23 levels in non-dialysis dependent CKD disease. The drug has been gaining exceptional traction in treating hyperphosphatemia in CKD while this approval has granted patients and physicians with a new option to help manage the complex disease. This chain of events is likely to bring a transformation in the way commercialization of ferric phosphate industry has been perceived for long. The application portfolio of this industry spans the pharmaceutical, food & beverage, and agriculture, on the grounds of which experts forecast a rather lucrative growth graph for the worldwide iron phosphate market in the coming years. Not to mention, on a global scale this business sphere is further likely to witness extraordinary proceeds from rapid developments in the automotive industry. The proliferation of electric and battery-powered cars has further taken the global iron phosphate industry by storm, given that lithium-ferric phosphate batteries has practically brought the battery-powered zero emission cars to life. Endowed with a vast end-use landscape, ferric phosphate industry is certain to acquire much popularity over the ensuing years. 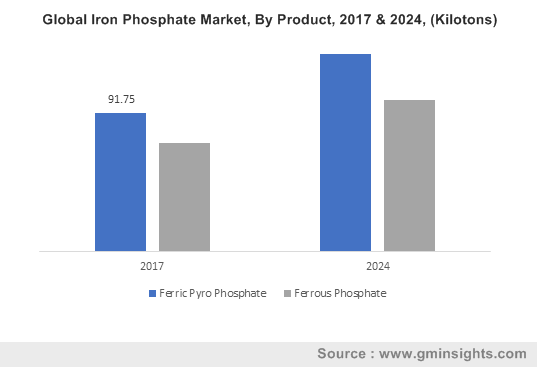 A presumption validating the same is of Global Market Insights, Inc. that forecasts the overall ferric phosphate market to exceed a valuation of USD 700 million by 2024.